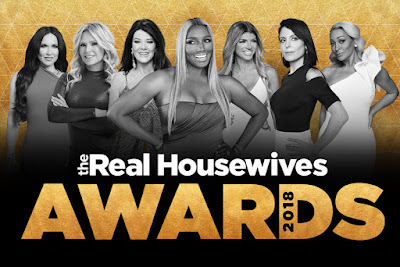 iRealHousewives | The 411 On American + International Real Housewives: Bravo Announces The Fifth Annual ‘Real Housewives Awards’ — See Full List Of Nominees! They're back! This week, Bravo announced the nominees and categories for the fifth annual Real Housewives Awards. The ceremony has ten brand new categories, which are inspired by going back to school. The 10 categories, including Most Iconic Moment, Best Shade and Most Memorable Wig to name a few. Click here the view the the complete list of categories and nominees on Bravo's official website or click below the view all the categories and nominees all in one section! The 2018 winners will be revealed on October 29 at 11 p.m. ET/PT, in a special episode of “Watch What Happens Live with Andy Cohen” devoted to the “The Real Housewives Awards,” where host Andy Cohen will honor the leading ladies of each category. For the latest on “The Real Housewives Awards,” fans can visit BravoTV.com/RHAwards, which will serve as a hub for “Real Housewives” content, including hilarious impersonation videos from Bravo superfan Amy Phillips and more. Viewers are also encouraged to join the conversation by using the official hashtag #RHAwards. To vote in this category CLICK HERE!